The BlackBerry App World is the RIM application distribution solution. Quite well organized, it accepts payment by credit card or Paypal. Some apps you can get for free of course. Apps can be managed on a computer. There are enough categories and a search box to make searching easier. There's a basic filtering system as well - it allows you to check out the highest rated free and paid applications, as well as the newest titles. In general there's hardly much to complain about the BlackBerry App world interface. As one would expect nowadays, the BlackBerry Torch 9810 is equipped with a built-in GPS receiver and comes with A-GPS support. For navigation you get BlackBerry Maps preinstalled. Unfortunately it is yet another application that only works with a BlackBerry internet plan activated. And the only navigation option you get is directions. Qualcomm Snapdragon 1.2GHz processors, extra bit of RAM, the new OS 7 with Liquid Graphics, a bump in screen resolution and HD video - they're all one phone actually, different shape and size. Of all three phones however, the Torch 9810 is the one that doesn't completely start from scratch. It's a sequel to the original Torch 9800. Up from 9800 to 9810 doesn't seem like much but the numbers don't tell the whole story. The new Torch slider has plenty of upgrade value: better screen, more processing power, silkier interface and HD video. Not bad at all for a phone built on the exact same chassis as the predecessor. The Torch 9810 is basically a Bold Touch rebodied into a slider. The key absence is NFC but the Torch is a different breed, more likely to mix business with pleasure. So the bigger screen gives more credibility to its improved media skills. Another important difference is the QWERTY keyboard. We found the one on the Torch 9810 slightly less comfortable than that of the Bold Touch. Only just though - and still incomparably better than having no physical keys at all. Most BlackBerry users will agree, we think. 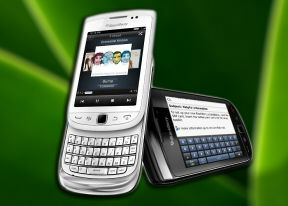 Long-term users, committed to BlackBerry for the security of their service, will be pleased with the Torch 9810. It seems well on time too, released exactly a year after the predecessor. Their sales have always been carrier-centric and they're probably eyeing many original Torch 9800 users with contracts due for upgrade. As for newcomers, the Torch 9810 is the best BlackBerry can offer at this point - and that means more polished touchscreen experience, more speed, more power and some new skill. A warning is due though - RIM's phones always come with a hefty price tag. The latest are obviously the priciest and the Torch 9810 finds itself in a company it's not likely to enjoy. We won't make a fuss over it because if the BlackBerry service is a must, even the world's finest smartphones become irrelevant. For those who have a choice and want to exercise it, there's no shortage of Droid and Symbian messengers to choose from. Some of the more recent Motorola Droids and Milestones are an obvious alternative. The likes of the Nokia E7 and the Sony Ericsson Xperia pro are in the picture too. Even the new Sony Ericsson Xperia mini pro has a claim to stake, fresh from a massive upgrade. The HTC Desire Z will do too if you don’t mind a year-old package. The HP Pre 3 could've been one of the contenders - and a strong one too. But it wasn't meant to be. The Pre 3 was discontinued before it even made it to the markets. Sad story, but it helps appreciate RIM's commitment and effort even more. So, RIM have themselves a fleet of new touch phones. The new generation is promising - and delivering - more power and better user experience. The BlackBerry Torch 9810 has an important role in that. The way we see it, it's not just a solid upgrade. It's trusted to provide continuity. The new lineup we've just finished reviewing is a transitional generation. QNX is the way of the future. The OS 7 and the new Bold and Torch are the base to build on.